Type specimens are used to designate species. What is the nature of the relation between a type specimen and the species it designates? If species names are rigid designators, and type specimens ostensively define species, then that relation is, at the very least, a close one. Levine (Biol Philos 16(3):325–338, 2001) argues that the relationship of type specimen to a named species is one of necessity—and that this presents problems for the individuality thesis. Namely, it seems odd that a contingently selected specimen should belong to a species of necessity. 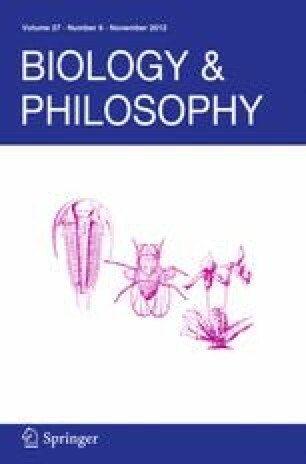 In considering Levine’s argument, LaPorte (Biol Philos 18:583–588, 2003) suggests that recognizing the distinction between de re and de dicto necessity resolves Levine’s worries. I reconsider the motivating question: does a type specimen belong of necessity to the species that it designates? In light of taxonomic cases and practice the answer is clear: definitively not. This is particularly clear in the case of re-designation of types by taxonomic decree. I explain how this helps reveal how taxonomists prioritize competing (and sometimes conflicting) theoretical commitments, and offer a defense of the individuality thesis as applied to these particular cases. In short, I demonstrate how to misidentify a type specimen. Sean Barry for sharing details of petitioning the ICZN and the case in question; Joseph LaPorte; Alex Levine; Michael Ghiselin; Arthur Shapiro; Matthew Slater; Elijah Millgram; Spring 2012 PHIL 5400/6400; Sarah George; Randall Irmis; Natural History Museum of Utah Faculty, Staff & Volunteers; Sam Murray for images of T. s. infernalis and T. s. tetrataenia; and the participants and organizers of POBAM 2012.